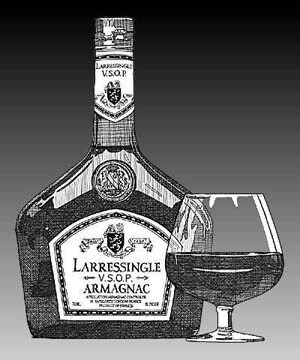 A New York ad agency required a product illustration of Larressingle Armagnac for newspaper advertising use. Through his New York artist rep, Randal Birkey was contracted to prepare a line art illustration of the Larressingle Armagnac product. The art was completed by hand in a pen and ink style and a high resolution copy delivered to the client.